Summary: Late yesterday, a third drone intrusion into the area under a Temporary Flight Restriction caused the helicopters that were delivering food for the firefighters on White Bird Ridge to return to the helibase. Drones create a serious safety hazard for aircraft, and air operations did not resume until the threat was resolved. One-tenth to two-tenths of an inch of rain fell on the fire area, raising fuel moisture substantially in the fine fuels and limiting fire behavior to backing, creeping and smoldering. When the storm front passed, firefighters resumed work on the fireline on White Bird Ridge north of Pollock Mountain. Crews will remain on this remote section of line for several shifts. Potential locations for containment line west of Hillman subdivision were scouted. Equipment was retrieved from the north end of the fire where it was no longer needed. Today, a packer and mulestring will begin supplying the spike camps on White Bird Ridge. This will free up helicopters for direct suppression missions. Operational assignments are similar to Monday, with crews and aviation resources working to secure the west flank of the fire to prevent it from becoming established in the Rapid River drainage. Firefighters are also attacking hot spots on the far south end of the fire. Heavy equipment will construct indirect fireline on the south end of the fire east to Hwy 95. Temperatures will begin to warm again and relative humidity levels will drop. Gusty winds are likely along ridgetops. Community Meeting: Tonight at 6:30 pm Mountain Time, 5:30 Pacific Time. New Meadows High School, 500 N. Miller Ave, New Meadows. Meeting will be livestreamed on https://www.facebook.com/RattlesnakeCreekFire/. 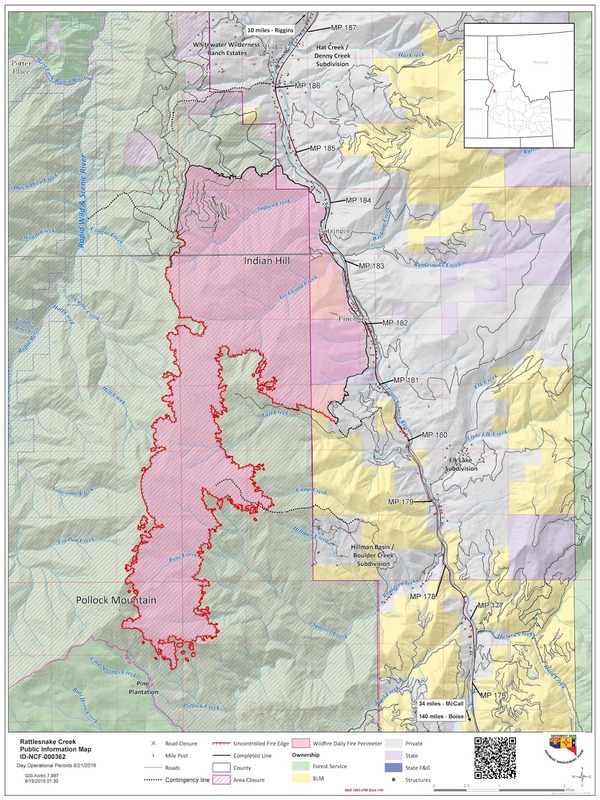 Evacuations/Closures: Residents in Hillman Basin and Boulder are in “Go” status. 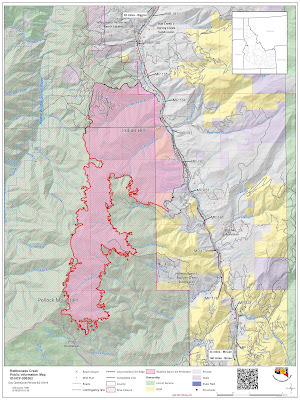 Residents in the North Pollock, Elk Lake and Pinehurst areas and residents along Hwy 95 from mile marker 167 to 177 are in pre-evacuation status (“Be Set”). Smokey Boulder Road to Railroad Saddle is closed. Both Idaho and Adams counties use AlertSense for emergency alerts. In Idaho County, call the Sheriff’s Department @ 208-983-1100 to enroll; in Adams County, visithttps://bit.ly/2AU0C5R to sign up. Additionally, the Nez Perce-Clearwater and Payette National Forests have area closures in effect, including portions of the Hells Canyon National Recreation Area (NRA); see https://bit.ly/2ATSand,https://www.fs.usda.gov/payette or Inciweb for more details. Announcements: Stage 1 Fire Restrictions are in effect; use the following link for specific restriction informationhttps://bit.ly/2ag2SUy . For public and firefighter safety, please adhere to all safety signage and speed reductions. Do not stop along the highway corridor near the fire. For road conditions and closures http://511.idaho.gov/.